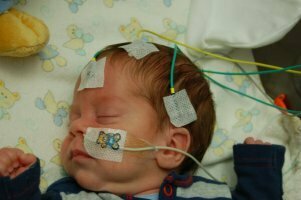 NEMO stands for: Treatment of NEonatal seizures with Medication Off-patent: evaluation of efficacy and safety of bumetanide. NEMO is an EU FP7 funded project that will be the largest multicentered European study of neonatal seizures and their treatment. Please click here for a summary, for background, for objectives and for impact of NEMO. In the first instance, NEMO study will evaluate bumetanide, a drug targeted at an age dependent mechanism which is thought to be responsible for the high incidence of seizure in the neonatal period. This will be the first time that an antiepileptic drug (AED) specifically aimed at this age-group will be evaluated in a large, adequately powered, randomised trial with EEG monitoring, recognised to be the "gold standard" method for seizure diagnosis in the newborn. Bumetanide cannot be tested as an AED on older children or adults as this mechanism ceases to be effective during the first few months of life. On the following pages you will find more information about the project, the group of partners involved, our dissemination activities as well as a contact form to get in touch with us.